As many of you will know, I write a lot of waffle in this blog which you sometimes can’t be bothered to read. For example, the Kilimanjaro trip report I wrote last month came to an eye-glazing 5,000 words. While I believe that post was a masterpiece that is well worth reading in its entirety, not all of you will agree. In that case, this post is for you. As well as scribbling my notes in a diary every evening (or these days I tap it into my phone), I stagger around with a video camera recording some footage for posterity. When I get home, I stitch it all together into a series of short (five minute or so) videos. These videos are amateur in the truest sense (amateurish might be a better word). They are unscripted; I say the first thing that comes into my head. I gasp frequently in the high-altitude air, and I often have to shout above the sound of the wind. The wind is so loud that it drowns out my voice in places (which is probably a good thing). I virtually never use a tripod, and many people have become seasick watching them. But I enjoy going back over them, and frequently spend part of an evening reminding myself of trips I did years ago. 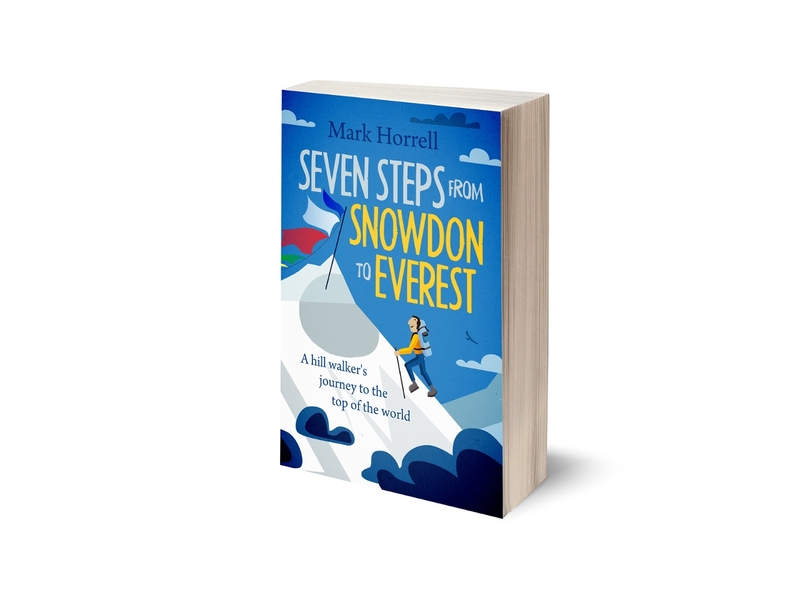 They give a flavour of a trek or a climb even the best of writers (and me) would struggle to capture in words. 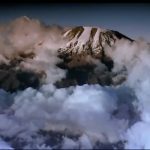 I have produced seven short videos of my Kilimanjaro trek in December. We spent a night on the summit, and explored the three craters thoroughly. You can watch the complete playlist here. It’s 42 minutes long in total, and includes one video of our ascent of Mount Meru. If you don’t want to watch them all, here are three which give a good flavour of the trek. Thanks to Edita for providing some of the footage. 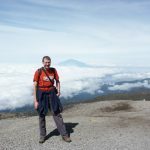 We chose to climb Kilimanjaro by one of its less popular trails, the Rongai Route, which ascends the mountain from the northern side, looking across the Tanzanian border into Kenya. 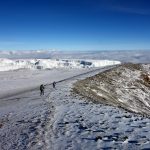 Starting from farmland on Kilimanjaro’s lower slopes, a good path climbs through pine plantations and forests of giant heather. The forests here are not as thick as those on the southern side, which the majority of trekkers to Kilimanjaro will be familiar with. We were soon through them into the moorland zone, where vegetation was sparser and the land more dusty. Our guide Joseph was a bit of a joker with a good sense of humour. Every day he taught us a few useful (and sometimes not so useful) phrases in Swahili which we’d spend much of the walk trying to memorise. Warning: this video contains some silliness. The Rongai Route joins the Marangu Route at Kibo Huts (4,700m) on the east side of Kibo, Kilimanjaro’s main summit. This is the place where trekkers on both routes launch their summit attempts from. Most people leave for the summit between midnight and 1am, and climb through the night to Gillman’s Point, where the route joins the outer crater rim. Because we were camping on the summit and had a much shorter day than other groups (and we don’t like night-time ascents), we left after 4am and were still low on the route when the sunrise tanned the sky behind Mawenzi. This early start gave us plenty of time to reach the summit (Uruhu Peak) early in the morning. We reached it at 9.15, and could easily have descended down to Kibo Huts, or even Horombo Huts at 3,700m the same day had that been our schedule. As it was we completed most of the ascent in bright sunshine, and arrived on top after the other trekkers had departed. It’s much more satisfying and peaceful to be up there alone, and we had just a half hour descent to our camp in the outer crater. I’ve been lucky to have visited some amazing mountain landscapes over the years, and the 24 hours we spent on the summit, exploring the crater, was up there with any of them. Kilimanjaro’s three concentric craters cover a huge area, and those who walk along the outer crater rim from Gillman’s Point to Uhuru Peak see only a small part of it. We spent an afternoon walking across the vast plains of the northern part of the crater, looking down the Western Breach and up at the Northern Icefield. The following morning we walked up the hill to look into the inner crater, with its impressive Ash Pit disappearing into earth. Those few minutes walking around it were an experience I will never forget. The wind was tempestuous and lashed us like a whip, but in a strange way it felt supremely peaceful. After walking roughly 270 degrees of the crater we tried to find a shortcut down to Gillman’s Point. But at that moment the clouds boiled up from below, and we were soon lost in a whiteout. Joseph was in unfamiliar territory, and he wisely decided to return the way we came, all the way round the crater, back to our campsite. Once there, our return to Gillman’s Point and descent to Kibo Huts was swift. I was inspired to spend a night on the crater after watching David Breashears’ film Kilimanjaro: To the Roof of Africa last year. Towards the start of my video you might recognise my appalling impression of Roger Bilham, the enthusiastic science boffin in Breashears’ film. An alternative career in acting is not likely for me after this. 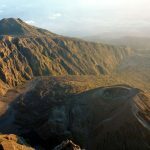 As I’ve said in previous posts, while for nearly everyone reaching the summit of Uhuru Peak will be the main goal of their trip, visiting the inner crater is an equally fulfilling experience. I hope that after seeing these videos more people who have their hearts set on the summit will consider exploring the crater too. Hope to have a book and CD version of this soon. Love the videos. No matter if the blog is a bit wordy here and there with scenery and commentary like this!